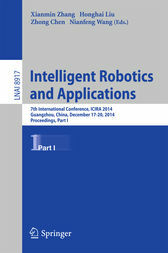 This two volume set LNAI 8917 and 8918 constitutes the refereed proceedings of the 7th International Conference on Intelligent Robotics and Applications, ICIRA 2014, held in Guangzhou, China, in December 2014. The 109 revised full papers presented were carefully reviewed and selected from 159 submissions. The papers aim at enhancing the sharing of individual experiences and expertise in intelligent robotics with particular emphasis on technical challenges associated with varied applications such as biomedical applications, industrial automations, surveillance, and sustainable mobility.